some informational picketing in industrial and shopping areas prior to the strike. entrance of the store, handing out leaflets, again covering their window cases with stickers and explaining the situation to all passers-by. wanted to and that they could not prevent it. In fact, we went on until we had exhausted the hundreds of leaflets and got almost hoarse after so much shouting. We were surprised about the low participation in the strike, specifically on the side of the businesses in the city centre, and about the many people we saw shopping despite the fact that it had also been declared consumption strike day. The participation was greater in large companies and institutions, but official figures have not been published yet. At noon we joined the protest at the Town Hall square and our slogans and the firmness with which we expressed them, made the people gathered there rise up. We were also interviewed by a local newspaper and our photograph and interview were on front page of its digital version for a few hours. 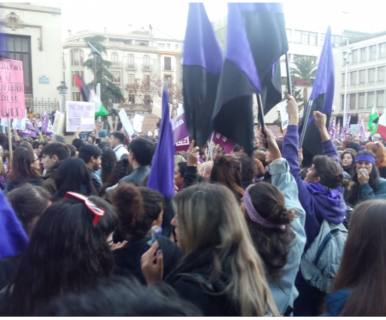 Finally, we went to the unitary demonstration in a block of our own, carrying a large banner, our motto "precarious and organized, against patriarchy and capital” on it. We had our flags and loudspeakers and were surrounded by a crowd of women who shouted our slogans. The event itself was a massive success; the municipal police estimated the attendance in 60,000 people, mostly women. The collection of homemade banners with original and revolutionary messages was stunning, and the music and the screams of protest, joy and also anger were thrilling. To get the awakening of feminist and class awareness in increasingly more women is only a very small first step on the long road leading to full equality of rights. We will not relent in our struggle.